Chuck Cooper with Boston Celtics Coach Red Auerbach. The Pittsburgh native had attended Westinghouse High School and been a star player for the Duquesne University Dukes. Now, Cooper’s been named as a member of the Naismith Memorial Basketball Hall of Fame class of 2019. The honor was applauded by Cooper’s son, Chuck Cooper III, who said he was glad his late father’s contributions to basketball were being recognized. “It just really means the world to me and my family,” Cooper said. The elder Cooper was an All-City player in Pittsburgh and after his 1944 graduation, went on to serve in the military during World War II. When he returned, he enrolled at Duquesne, scoring more than 1,000 points for the Dukes and leading them to national tournaments. After earning his degree in education in 1950, he played for the all-black Harlem Globetrotters. Then on April 25, 1950, Celtics owner Walter Brown selected Cooper for his team, famously saying he didn’t care if Cooper was “striped, plaid or polka dot,” saying he was the most talented player in the draft. He was the first of three black players who would be chosen to play professionally that year. Cooper’s son said that title was a big responsibility, but one that his father was ready to take on. 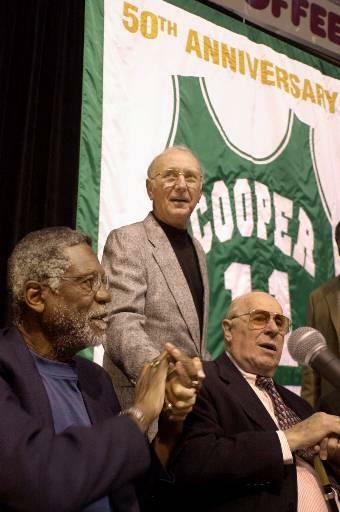 Boston Celtics basketball legends Bill Russell, left, Bob Cousy, center, and Arnold "Red" Auerbach greet one another in Boston, Wednesday, Feb. 7, 2001, moments before a panel discussion about race relations in sports. The event was timed to coincide with Black History Month and the 50th anniversary of the Boston Celtics' drafting Chuck Cooper, the first black player drafted into the NBA. After he retired from basketball in 1956, Cooper earned his masters degree in social work from the University of Minnesota. He returned to Pittsburgh to run anti-poverty organizations and serve on the school board. He became the first African American to lead a city department when Mayor Pete Flaherty appointed him head of Parks and Recreation in 1970. “He was just somebody that was caring and compassionate about other people and really wanted to do what he could to make a difference for those underserved populations,” Cooper III said. Cooper was humble about his accomplishments, his son said. Even when he was approached in public, he was always gracious. Cooper died in 1984. The Chuck Cooper Foundation, established in 2013, provides graduate-level scholarships to students who complete service projects and give back to their communities. The service element, Cooper III said, is an important tenet of his father’s legacy. Chuck Cooper will be inducted into the Hall of Fame in September. His son said he’s glad his father will finally be recognized for breaking the color barrier. Duquesne has retired Cooper’s jersey and plans to name its new field house after the player. He’s also received a number of honors from the NBA and has consistently been named as one of the most influential players in the sport.